With the first line, we see “Third Artillery.” But from there things fall into disorder. We find the 14th Illinois Cavalry reporting some mountain howitzers on hand. Then five batteries identified by commander or sponsor. Lastly, the 51st Illinois Infantry reported a couple 6-pdrs. So pardon the lengthy explanations (or wild guesses!) to follow. 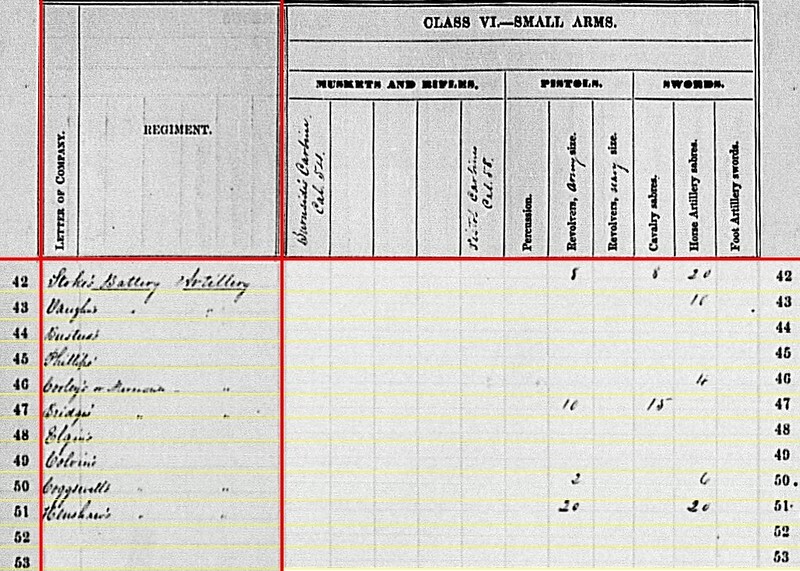 Battery A, Third Artillery: We same the same identification for the fourth quarter, 1862, but noted this battery was most often cited as the Springfield Light Artillery, or Vaughn’s Battery (after Captain Thomas F. Vaughn). The latter was used for the first quarter, 1862. As mentioned in those earlier posts, the designation of a third regiment is a mystery to me. But we can match the other details to this battery’s service. 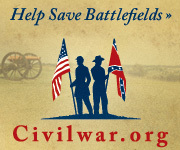 Reporting six 3.80-inch James Rifles, the battery, part of the garrison of Memphis, Tennessee, was split into sections at this time, one at Germantown and another at Collierville. I read this as “Col. 14th Cav?. Stores in charge“: Presuming I transcribe that correctly, this indicates Colonel Horace Capron’s 14th Illinois Cavalry had four 12-pdr mountain howitzers on hand. At the time of reporting, the regiment was in the First Brigade, Third Division, Twenty-third Corps, Army of the Ohio, reporting at Tompkinsville, Kentucky. The regimental history provides some insight into this “howitzer battery,” along with accounts of use. The section was under command of Lieutenant Henry Clay Connelly. The battery, and regiment, would be involved with pursuit of Morgan in July. Stokes’s Battery: This is the Chicago Board of Trade Independent Battery Light Artillery, commanded by Captain James H. Stokes. 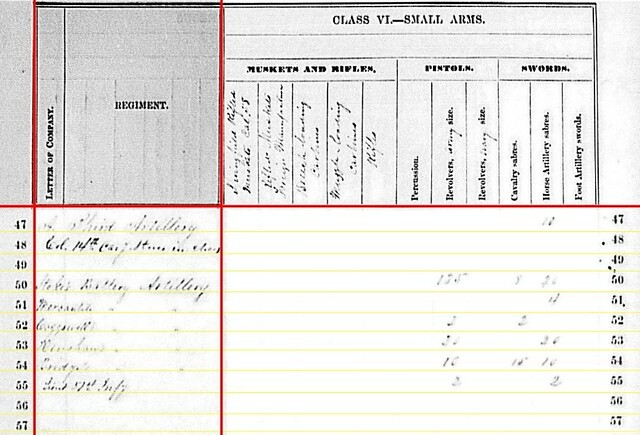 If I am reading the faded ink correctly, the battery reported from Manchester, Tennessee, with four 6-pdr field guns, one 6-pdr (3.67-inch) rifle, and two 3.80-inch James rifles. The battery was part of the Second Cavalry Division, Cavalry Corps of the Army of the Cumberland. Mercantile Battery: At Vicksburg, Mississippi with three 6-pdr field guns and two 3-inch Ordnance Rifles. Under Captain Patrick H. White, this battery was assigned to Tenth Division, Thirteenth Corps. 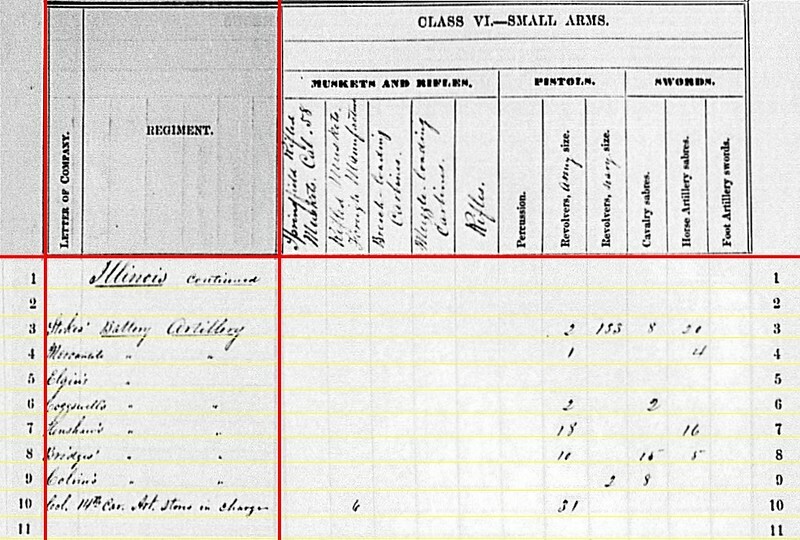 Cogswell’s Battery: Reporting at Nashville, Tennessee with four 3.80-inch James Rifles. The location probably reflects the July 1864 receipt date. In June 1863 the battery was at Vicksburg as part of the First Division, Sixteenth Corps. 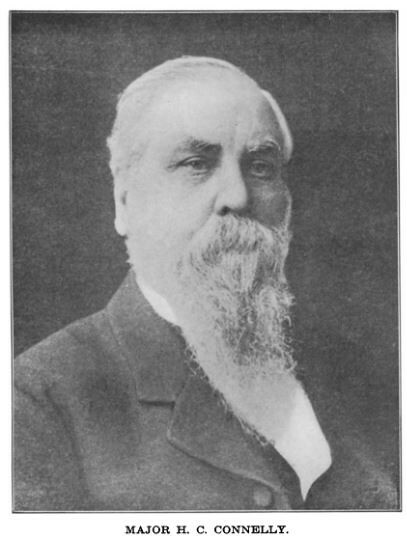 Lieutenant Henry G. Eddy remained in command. Henshaw’s Battery: Indicated at Loudon, Tennessee with four 6-pdr field guns and three 3.80-inch James Rifles. The location is valid for a later reporting date. In June 1863 Captain Edward C. Henshaw’s battery was part of the Third Division, Twenty-third Corps, Army of the Ohio, operating in Kentucky. Bridges’ Battery: At Manchester, Tennessee with two 6-pdr field guns, two 12-pdr field howitzers, and two 3-inch Ordnance Rifles. Captain Lyman Bridges commanded the battery, which supported the Pioneer Brigade, Army of the Cumberland. “Lieut 51st Infy“: Reporting two 6-pdr field guns. I leave a large, bold question mark over this one. If I am correct with the identification, the regiment was assigned to Third Brigade, Third Division, Twentieth Corps at the time of report. This puts them in the middle of the Tullahoma Campaign. Missing from this list is the Elgin Battery and Colvin’s Independent Battery, which were also operating in Kentucky at this time. With those omissions, coupled with the question mark on the last line entry, leads me to call this the messiest summary section presented thus far. Springfield Battery: 72 shell, 28 case, and 56 canister for 12-pdr field howitzers. Recall the battery reported similar quantities on hand even back in December, with no weapons in that caliber on hand. 14th Cavalry: 108 shell, 576 case, and 108 canister for 12-pdr mountain howitzers. Mercantile Battery: 305 shot, 340 case, and 61 canister for 6-pdr field guns; 102 case for 12-pdr field howitzers. With that last entry, we have another mismatch of ammunition. Henshaw’s Battery: 369 shot, 375 case, and 84 canister for 6-pdr field guns. Bridges’ Battery: 195 shot, 266 case, and 122 canister for 6-pdr field guns; 100 shot, 250 case, and 50 canister for 12-pdr field guns; 50 shell and 350 case for 12-pdr field howitzers. Yet another line with mismatched ammunition reported. 51st Infantry: 70 shot, 84 case, and 42 canister for 6-pdr field guns. While we can wave off the Springfield Battery’s howitzer ammunition pointing to previous reports, the issues with the Mercantile and Bridge’s battery leave questions. Springfield Battery: 48 shot, 73 percussion shell, and 30 canister for 6-pdr, 2.6-inch bore; 63 bullet shell for 3.80-inch rifles. Only the latter would work for the battery’s reported rifles. Stokes’ Battery: 17 shot and 80 percussion shell for 3.80-inch rifles. Mercantile Battery: 42 canister, 105 percussion shell, 93 fuse shell, and 160 bullet shell for 3-inch rifles. Henshaw’s Battery: 63 percussion shell for 3.80-inch rifles. Bridges’ Battery: 84 canister, 65 percussion shell, 250 fuse shell, and 105(?) bullet shell for 3-inch rifles. Perhaps the entries for the Springfield Battery were transcription errors. Perhaps. Springfield Battery: 77 canister for 3.80-inch rifles. Stokes’ Battery: 40 canister for 3.80-inch rifles. Springfield Battery: 350 shot, 480 shell, and 30 canister for 3.80-inch rifles. Stokes’ Battery: 33 shot and 72 shell for 3.80-inch rifles. Cogswell’s Battery: 31 shot, 407 shell, and 47 canister for 3.80-inch rifles. Stokes’ Battery: 292 shell for 3.80-inch rifles. Springfield Battery: 36 canister for 3.80-inch rifles. So, if you served in the Springfield Battery and canister was ordered, one might find three different varieties in the limber chest. 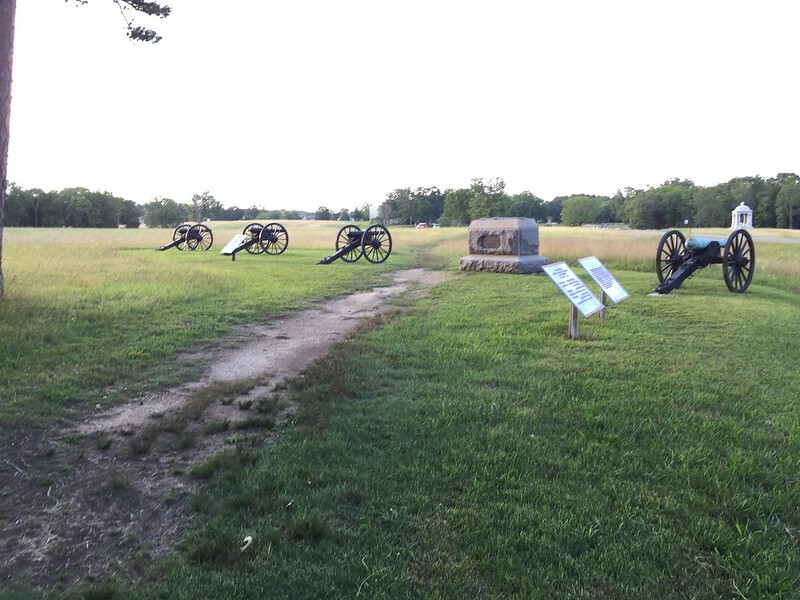 Stokes’ Battery: 135 Army revolvers, eight cavalry sabers, and 26(?) horse artillery sabers. Mercantile Battery: Four horse artillery sabers. Henshaw’s Battery: Thirty (?) Army revolvers and twenty horse artillery sabers. Bridges’ Battery: Ten Army revolvers, fifteen cavalry sabers, and ten horse artillery sabers. 51st Infantry: Two Army revolves and two horse artillery sabers. Somewhat understandable the Board of Trade Battery (Stokes’) assigned to the cavalry would have a lot of small arms. We find the Mercantile Battery, serving at Vicksburg, with just four sabers. Cogswell’s was little better with a pair of pistols and a pair of sabers. But, speaking against my presumptive identity, we have small arms reported for the last line. Normally we wouldn’t see that carried (ref. the 14th Cavalry line on the same sheet). But whoever had those 6-pdrs also had matching revolvers and sabers.